DaVinci Roofscapes® has introduced a new free ebook entitled “FRESH Color Schemes for Homes with Brick or Stone” on their company website. Authored by Kate Smith with Sensational Color, the online ebook showcases 60 combinations of home exterior options from the top-down. Brick home exterior accented by a mix of composite DaVinci Roofscapes roofing tiles in Mountain and Tahoe color blends. 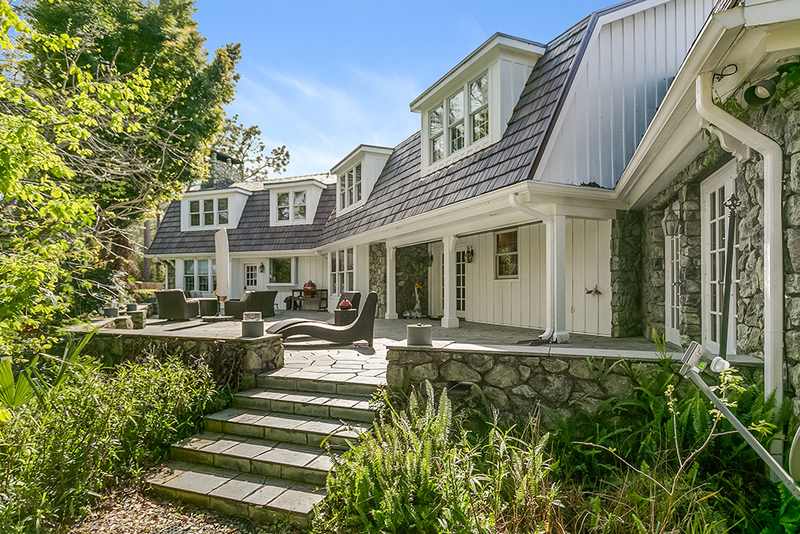 We’ve been able to showcase such a wide range of options that I’m certain homeowners will find one or more that complement their house exterior. 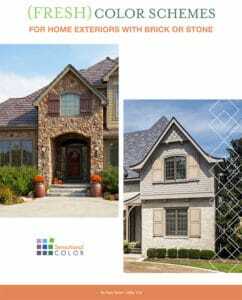 To provide exterior color guidance to anyone with homes featuring brick or stone exteriors, DaVinci Roofscapes® has introduced a new ebook on their company website. Authored by color specialist Kate Smith with Sensational Color, the new “FRESH Color Schemes for Homes with Brick or Stone” guide is offered as a free tool for homeowners. The online ebook showcases 60 combinations of home exterior options from the top-down. 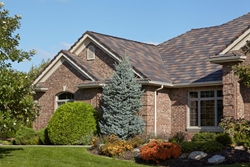 Smith has paired up composite shake and slate roofing selections from DaVinci Roofscapes with different brick and stone products from Acme Brick, Coronado Stone Products and Glen-Gery. Each palette also features suggested paint colors to enhance the entire home exterior. “This is the fourth ebook I’ve created following the FRESH method for selecting exterior colors for the home,” says Smith, chief color maven with Sensational Color and a national color trend analyst. “This guide includes the five key factors people should consider when selecting color palettes for their home exterior: fixed features, regional colors, environment and surroundings, style of the home and historic colors involved. Within the ebook Smith has identified six brick colors (red, pink, white/cream, gray, tan/buff, and brown/black) and five stone colors (tan, brown, gray, greige/cream and white). Five different color palette suggestions are recommended for each brick or stone color, with 10 palette suggestions for red brick, for a total of 60 unique exterior color combinations. The newest ebook from DaVinci, the color leader in composite roofing, is the fourth in a series of free ebooks dedicated to providing people with guidance on adding color to their home exteriors. The “FRESH and Natural” ebook provides color insights when selecting composite shake roofing in the Natural Crafted Collection. The “FRESH Home Exteriors Color Guide” offers five steps for finding the perfect hue for a home exterior. The “FRESH Color Schemes for Your Home Exterior” reviews seven different home styles and provides “top down” color recommendations for each style. Now, the “FRESH Color Schemes for Homes with Brick or Stone” ebook showcases top down color suggestions for home exteriors with brick or stone. Each ebook (along with the Top Down Color Visualizer tool) can be found for free in the “Projects & Inspiration” section of the DaVinci website.